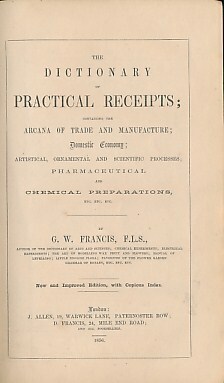 Barter Books : Francis, G W : The Dictionary of Practical Receipts; Containing the Arcana of Trade and Manufacture; Domestic Economy; Artistical, Ornamental and Scientific Processes; Pharmaceutical and Chemical Preparations, Etc. Etc. Etc. 230 x 140 mm (9 x 6 inches) - 348pp, + index, + ads. Brown embossed hardback cloth cover. G : in Good condition. Cover rubbed.